Ever since you started clown college you knew you'd make clown master. You've always had a knack for leadership, maybe it has something to do with your persuasive tactics. People have never described you as a funnyman but it's never been argued that you weren't memorable. 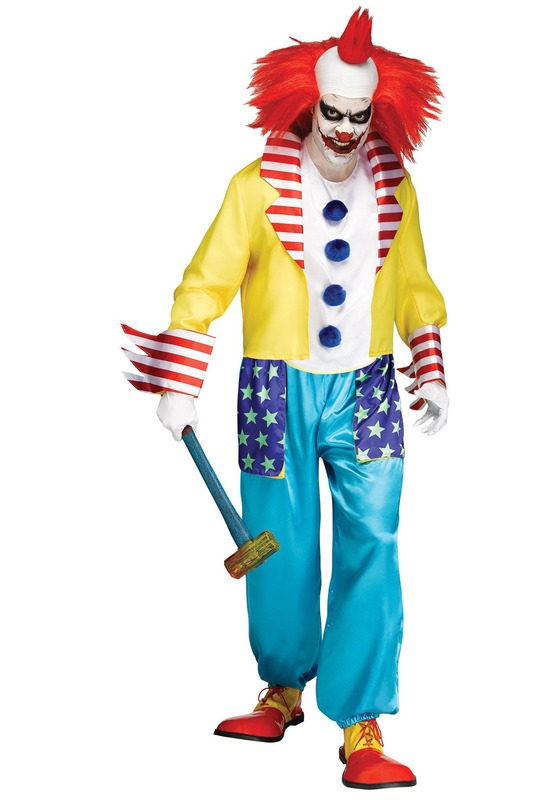 Sure, your ensemble has all the elements of a clown: the bright colors, the baggy pants, the floppy feet. You know you aren't fooling anyone, even a clown can see that your body language means business. All your dreams of becoming the head honcho of the clowning world are coming to head. No one gets a party clown permit without your go ahead. If you see a Crusty or Curly driving a tiny car without your stamp of approval than they'd better be ready to be called in for a clown conference (where twenty clowns climb into one phone booth and call you). And if they don't comply, those funny guys will have to meet your mallet friend, you call him knee-slapper. Even the clowns visiting with the circus know to be careful when they're on your turf because a master clown is the master of all of his domain. You act like a boss and you dress like the master. This satin ensemble has all the primary colors required in the clowning world, after all, you'd better set a good example for your underlings. The red, white, and blue shows off your patriotism with a touch of sunshiny yellow. This Halloween show up at a party in your clown master uniform, your form of entertainment is sure to be a scream.